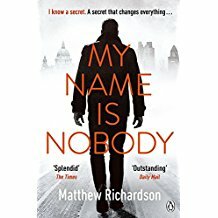 My Name is Nobody is a spy thriller based around the machinations of MI6 in London. Despite the activities of our security services being deeply cloaked in shadow; Richardson makes the activities on display appear truly authentic; and frighteningly so. This remarkable thriller starts in Istanbul August 2016 when agent Solomon Vine’s career is jeopardised when an interview with a Dr Ahmed Yousef goes dramatically awry and Vine is suspended in consequence. Dr Yousef had claimed during the meeting to have a secret ‘that changes everything’. Three months later Gabriel Wilde, MI6’s Station Head in Istanbul (who had sat in on the meeting with Dr Yousef) is violently abducted. Solomon is called back to investigate. It soon becomes apparent that the disappearance of Gabriel Wilde has far deeper ramifications for MI6. Solomon’s investigation reveals that something dramatic is going on that threatens the whole of MI6, and raises both a personal, as well as a professional conflict for him as he confronts the enormity of the secret that Dr Yousef stated being one that ‘changes everything’. The novel is occasionally cryptic and terse at times [as the author examines the spy-craft techniques that pepper political espionage] which tends to make it hard to fully identify with the array of multi-faceted characters – however this is a minor observation as this debut novel is indeed as the publishers claim - a ‘gripping, multi-layered and assured debut’. Matthew Richardson thanks in part to his background in political journalism is without doubt a name to watch for, as like the mysterious Dr Yousef, this debut thriller does indeed change everything, when one reviews the current direction of the espionage / thriller genre. The author, 26-year-old Matthew Richardson is hailed by his publishers as a rising star. This debut novel is one of considerable power making his publisher’s enthusiasm on target.